We started with the concept of weather vs. climate. I have been working on a unit that takes FOSS and NGSS to figure out how to create a weather unit that works more smoothly. I came up with the idea of treating my kiddos as meteorologists or better yet...travel agents. 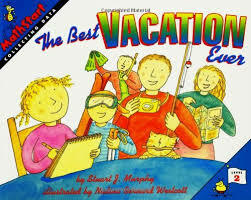 They would work on learning all they need to know by planning a trip to a major city in the world. They would use the Weather Channel app on the iPads to look up a different city per table. We will incorporate the FOSS weather tools as we go... By the way.... As we continue on our trip many of my second grade kiddos have never been out of our hometown or for that out of the state so we read a really nice book based on "stay"cations. After our book we discussed Wausau. What can we do in and around our town. With our list, we can do great things with little money. To start our FOSS integration, we measured with a thermometer and learned how to read one. We tested hot and cold water and recorded the temperature in our notebooks. Then when we were done we went to the smartboard and looked at hot spots and cold spots in the US. There is certainly a trend. We can see weather and climate. Finally, a cloud song....The Cloud Song lyrics.